Israel has documented evidence from inside Iran that the Islamic Republic has worked to develop nuclear weapons, sought to hide that program from the world while it was still progressing, and lied about it to the United Nations nuclear watchdog. And it’s not just one Iranian nuclear file—it’s over 100,000 of them. 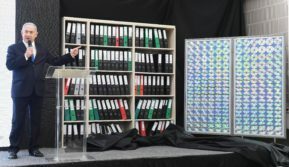 The files show Iran’s research into nuclear weapons and mounting them on missiles, as well as their plot to disguise the program from the world. And it also proves that Iran lied to the UN’s International Atomic Energy Agency (IAEA) about never developing nuclear weapons—thereby violating a key aspect of their nuclear deal with the major world powers. The United States, which has seen many of the files, was asking the same question as they approach a deadline in less than two weeks to either fix or nix their involvement in the Iran nuclear deal. US Secretary of State Mike Pompeo said in a press statement from his office that they are “assessing” what the files mean for the nuclear accord. He said the files reviewed so far are authentic. “For many years, the Iranian regime has insisted to the world that its nuclear program was peaceful. The documents obtained by Israel from inside of Iran show beyond any doubt that the Iranian regime was not telling the truth,” said Pompeo. Netanyahu too was discussing the discovery with world powers. In addition to speaking with the US, a separate statement from his office on Monday said Netanyahu already had spoken with the leaders of Russia, Germany and France, with Britain and China on the agenda. Those six nations were the powerful “P5+1” that negotiated the nuclear deal with Iran. In his speech, Netanyahu said the documents confirm the existence of the Iranian “Project Amad” to develop nukes. That program intended to build and test five 10 kiloton nuclear warheads. “That’s like five Hiroshima bombs to be put on ballistic missiles,” said Netanyahu. The Israeli leader said that Project Amad had plans for the “five key elements of a nuclear weapons program”—enriched uranium for fuel, cast metal nuclear cores, nuclear implosion systems, nuclear testing and placing the nukes on missiles. In the early 2000s, Iran was under international pressure and put Project Amad on the shelf. However, plans were made for “special activities” to continue under the guise of scientific work via multiple organizations. In 2018, the organization inheriting the “special activities” is headed by Dr. Mohsen Fakhrizadeh, who previously led Project Amad.